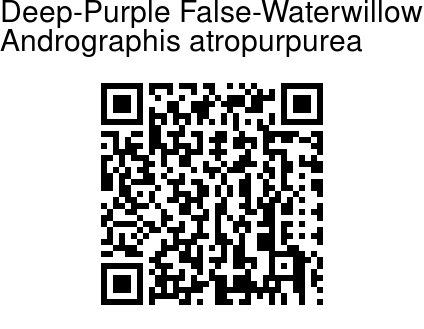 Deep-Purple False-Waterwillow is a nearly erect undershrubs, with stems hairy. Leaves are up to 10 x 4 cm, ovate, tapering, broadest at base, hairless; nerves 4 or 5 pairs, prominent; leaf-stalk 0-5 mm long. Flowers are borne in panicle with long lax racemes, scabrid; bracts and bracteoles subulate. Flowers are distant; sepals 5 mm long, subulate, hairy; flower 1.8 cm long, hairless, upper lip round, retuse, dark brown, lower lip shallowly lobed, light pink with brown spots; lower anther bases bearded. Capsule 22 x 3 mm, oblong, glandular hairy; seeds 8, round, hairless. 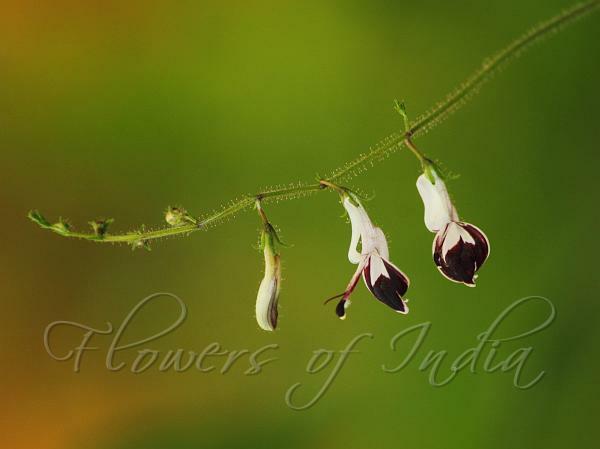 Deep-Purple False-Waterwillow is found in Western Ghats. Flowering: July-September.